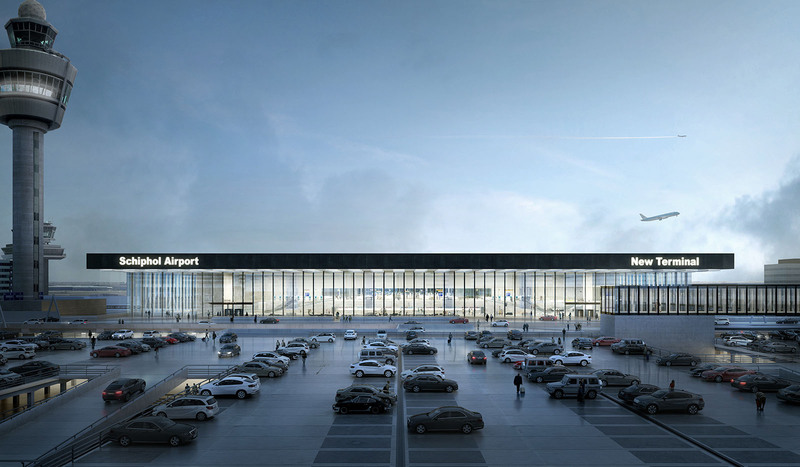 Bureau B+B to design the landscape for the New Terminal of Schiphol. For this Bureau B+B joins the design team for the expansion of the airport. Designed by KAAN Architecten, in collaboration with ABT, Estudio Lamela and Ineco, the new terminal will open its doors for the first time in 2023. It will provide extra space for 14 million travellers every year. As an addition to Departures and Arrivals 1, it is thus an extension of the existing terminal. Moreover, it will allow Schiphol to stick within the ‘One Terminal’ concept. Schiphol’s last major terminal expansion took place in 1993, when Departures and Arrivals 3 and 4 were extended. As always, functionality is a priority for the airport and the new terminal design fits in effortlessly. There is an abundance of natural light, along with simplicity and spaciousness. Bureau B+B is responsible for the design of the patios as well as the gardens and public spaces surrounding the Terminal building.